Safety underpins everything we do at JCW Electrical Group, our Zero Harm philosophy is woven into the fabric of our business DNA. This philosophy is adopted by the entire JCW Electrical Group family and its message ensures that our workforce remains focused on delivering projects incident and injury free, everyday. JCW Electrical Group has over a century of project execution and management experience. Our in-house Estimating and Project Controls teams have the know-how to deliver major projects on time and to budget. Our flexible delivery model encompasses early contractor involvement (ECI) at initial design phase, converting to construction flowing through to testing, commissioning and handover. The Supermarket Giant is in Australia. JCW completed the fitout and construction of both new sites on a very tight construction program. With over 200 lights in each store and other varius power requirements it was a great credit it our team and builder to complete these works on time and superb finish. 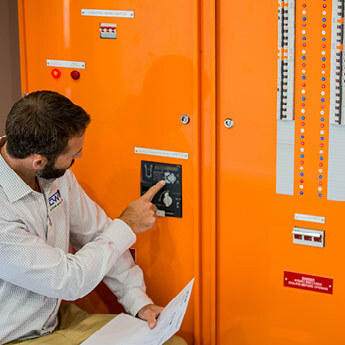 JCW Electrical have again secured their place as a leading electrical and communication education technology provider, helping another top level school in Busselton expanding their footprint in the area. JCW are happy to announce their commencement of a contract for the construction of a new Administration, reception and IT building, a new school hall and gymnasium with high spec lighting and sound, indoor sporting courts, a dance studio, weights room, full kitchen facilities and many other great amenities. Nothing has been missed with the uniform shop also being upgraded to match the rest of the new faces around the site. Fitness is rapidly becoming a part of everyday life for all of us. The Geographe Leisure Centre, operated by the City of Busselton is a pillar of the fitness community from Cape to Cape. JCW Electrical has now completed the full refurbishment of the Gym, crèche, kiosk and amenities areas at the centre. It doesn't stop there with the completion of a new age spin class room, office areas and multiple tenancies available to fitness professionals from all around the South west. The Geographe Leisure Centre services many schools, clubs and other organisations, with any and all of their fitness needs and being selected to assist in this process, is a proud moment for us as a company. In 2017 this world class venue undertook a major renovation and there was no expense spared. JCW is proud to be associated with the builder and client that completed this top quality fitout to ensure it represents the beautiful south west region of WA. New Gallery, Alfresco & Lounge dining & landscaping works were completed. A new Football and Softball Pavillion was constructed to host the local sporting teams and offer first class facilities. Two new pavilion as well as relocating existing lighting towers. The City of Bunbury constructed new facilities and function centres to host various sporting events. With the new buildings we also installed various lighting towers. Transforming an existing function centre into an Lifestyle estate. A huge project with over 15km of cable and conduit installed. Over 100 new homesites were created along with bowling green, Family Centre and Club house. We are still actively involved putting the new homes onsite as residents move in until stage 2 comes next! A hip new bar and restaurant that had an industrial but modern fitout. A credit to the builder and designers to deliver this great new venue. As major sponsors of the club we also have completed some recent projects such as a new bar redevelopment and the massive Big Screen inside the track. Over 100 TV screens put together to ensure the best vision can be seen anywhere on course for horse racing or other sporting events. Finger lickin good. Another iconic food chain, we were involved in bringing the colonel back to life with some new fitouts of these stores. Another busy medical centre we were engaged to fitout. JCW has completed various other specialised medical practices that have specific requirement for patient areas. JCW has recently completed various projects at Bunbury Port Authority. New road ways and LED street lighting to light up this key part of our busy port town.